The ACL is a tough, fibrous ligament connecting the femur (thigh bone) to the tibia (shin bone). The ACL is one of the ligaments that stabilises the knee during rotational forces which occur during pivoting and side stepping activities. The ACL usually ruptures if the knee twists abnormally when attempting to side step, pivot or landing from a jump. This often happens in twisting and pivoting sports as well as in skiing. A patient will normally feel or hear a snap, accompanied by pain in the whole knee. The knee normally swells significantly, either immediately or within an hour or two of the injury. The patient is unable to weight bear and is unable to finish the sporting activity that they are participating in. Treatment may be non operative (without surgery) or operative (with surgery). The goal of treatment is to provide the patient with a stable knee that will allow them to get back to their desired level of activity. This in turn will reduce the risk of further injury to the knee. Non operative treatment may be chosen for patients who wish to go back to sports but do not require side stepping or pivoting activities. Examples of these sports are straight line running, cycling and swimming. Skiing is often possible after non operative treatment. Non operative treatment involves physiotherapy. The physiotherapy is aimed at reducing the swelling and restoring the range of motion of the knee joint. The Physiotherapist will also undertake an intensive program to strengthen the muscles around the knee joint. Another component is proprioceptive training, which develops joint position sensation. This helps reduce abnormal movement in the knee and develops protective reflexes to prevent instability and further injury. Surgical reconstruction is indicated in those patients who have persisting functional instability or giving way, despite the non operative treatment described above. It is also indicated in anyone who wishes to return to sports involving twisting or pivoting. Surgery is best carried out once initial rehabilitation has obtained full range of motion in the knee. Small(5mm) incisions are made on either side of the knee and the arthroscope is inserted inside the knee joint. The knee is examined and any other problems are dealt with. The stumps of the torn anterior cruciate ligament are removed. Through a 2 cm incision just below the knee, 2 hamstring tendons are harvested from behind the thigh and fashioned into a graft. Tunnels are drilled in the femur and tibia in an angle that follows the path of the ruptured anterior cruciate ligament. The ligament graft is threaded through the holes and held with specialised fixation devices. The operation normally takes 60-90 minutes. Unless otherwise specified it is a day case procedure. Most patients go home on the day of surgery and can fully weight bear. You will need someone to drive you home. Patients are given a script for pain relief. Local anaesthetic is infiltrated into the knee during the operation to help control the pain in the first 12 hours. Physiotherapy and an exercise program starts within 48 hours of surgery. Your Physiotherapist will remove the bulky bandage and start range of motion and strengthening exercises. You will see your Surgeon to have your wound checked at approximately 10 days following surgery. They will see you again 6 weeks after surgery and again at 6 months. Most recovery takes place in the first 6 months with range of motion and strength continuing to improve after that. It is 12 months before you can return to twisting or pivoting sports. In 85-95% of cases the surgery results in a stable functional knee with a good outcome. 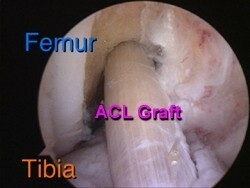 There is a higher chance of a poor outcome if there is co-existing damage to the knee in addition to the ACL rupture. deep venous thrombosis and pulmonary embolism – this complication is rare but they can be life threatening. The risk is increased by smoking, the oral contraceptive pill and hormone replacement therapy.